1 What is an EB-5 visa? This program was established by the United States Congress in 1990 to facilitate increased foreign investment in the U.S. economy. EB-5 visa is an opportunity for investors to gain a U.S green card through investment. Foreign investors who make a substantial investment in a U.S. business become lawful permanent residents, and eventual citizens, of the United States. The investment can lead to a green card for the investor to permanently live and work in the United States with their spouse and unmarried children under the age of 21. The United States Citizenship and Immigration Services (USCIS) operates the EB-5 visa program. if you are investing elsewhere, the minimum required investment is $1 million. The applicant must have not been involved in any criminal activity. 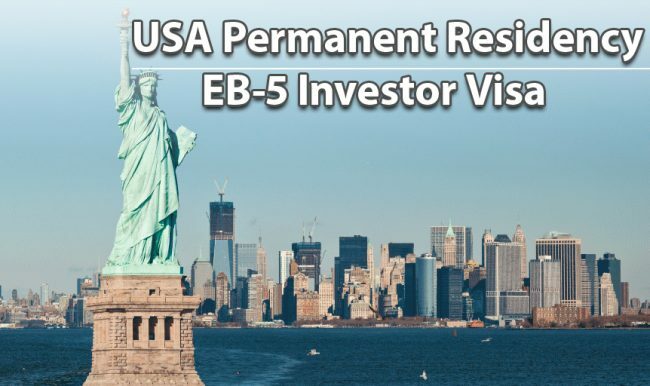 EB-5 investor visa applicants can make the investment through two options. Direct investors must find their own investment project and must take a direct managerial role in overseeing that project. Direct investment is best for those who want more hands-on control of their investment and the project that received their investment. The investment can also be made in an EB-5 Regional Center. This option is suitable for those who are more interested in the immigration goals of EB-5 rather than obtaining a maximum return on their investment. The regional centers are designated by USCIS to administer EB-5 investment projects. Regional centers are responsible for adhering to USCIS EB-5 program regulations. In this way, investors do not become solely responsible for meeting program requirements. As a result, investment through regional centers suits those who avoid direct management of their investment. It is recorded that around 90 percent of all EB-5 applicants choose to invest through a regional center. As per the USCIS requirements, the EB-5 investment must preserve or create a minimum of 10 full-time positions for qualified workers in the United States. This condition of job creation must occur within the two years conditional permanent residency tenure of the investor. Jobs created in EB-5 projects are categorized as direct, indirect or induced. – Direct jobs are related to the investment made in a direct business. It means that the proposed business created 10 jobs and the employees are working directly in the business. – In the Regional Center context, the applicant can count direct, indirect, and induced jobs toward the job creation requirement. The indirect job creation of Regional Centers allows projects to create hundreds of more jobs than solely relying on direct employment. Making an investment (direct/ in a Regional Center) that fulfills the requirement of creating 10 fulltime jobs. Upon I-526 approval, the investor submits their conditional permanent resident application either through the filing of an I-485, Application for Adjustment of Status, or DS-260, Application for Immigrant Visa. This is the petition that will confer the green card to the investor and his eligible dependents. Lastly, the investors file the I-829 form that must prove that all EB-5 requirements have been met at the end of the two year conditional residency. This allows the investor, their spouse, and their unmarried children under the age of 21 to become lawful permanent residents of the U.S, and receive their ten year green cards.